So today’s post is going to be short and savory like the meal I will be entailing. 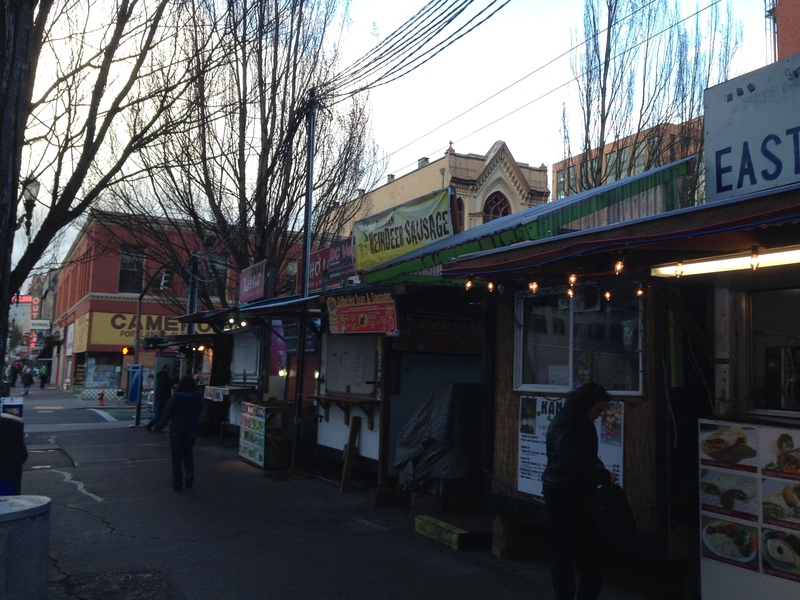 While I decided to have one of my spooky baked treats from Voodoo Doughnuts for breakfast on Friday morning, I decided that lunch would take place at one of the many food cart villages that can be found throughout Portland. 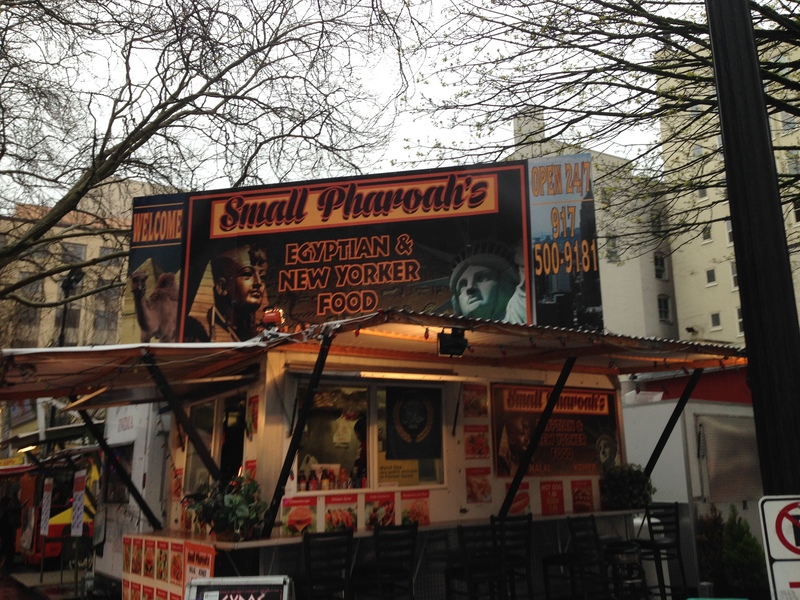 The concierge told me when I checked in to check out Alberta Street’s food carts, but it was a bit too far out of the way for my liking. 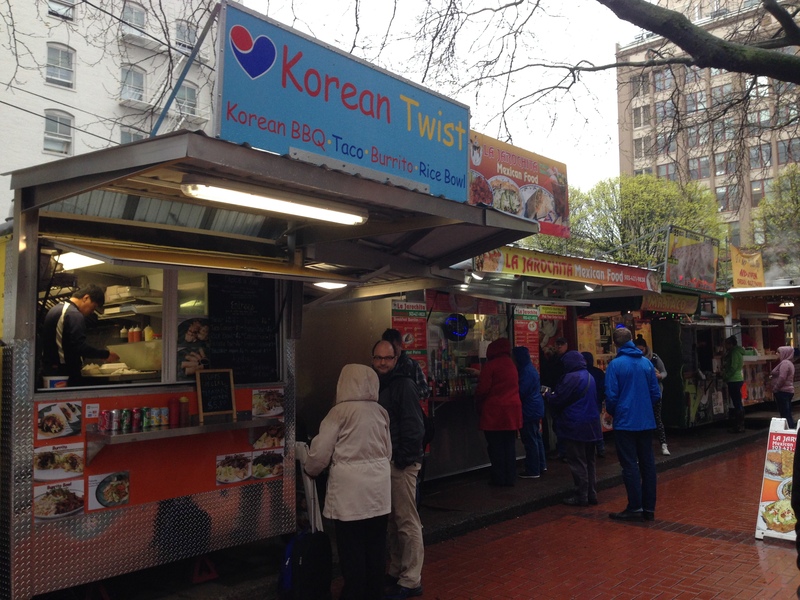 So, I remembered that I passed by a large pod of carts when going down SW 5th Ave. to the Pioneer Square stop in the heart of downtown Portland. Even though it was raining, it didn’t put a damper on my experience. As I made my way down the block long and deep hamlet of food hawkers, there was so much affordable food diversity it made me want to fall to my knees and praise the sustenance gods. After living in a monoculture for a year like Korea, you really appreciate the diversity of the USA. 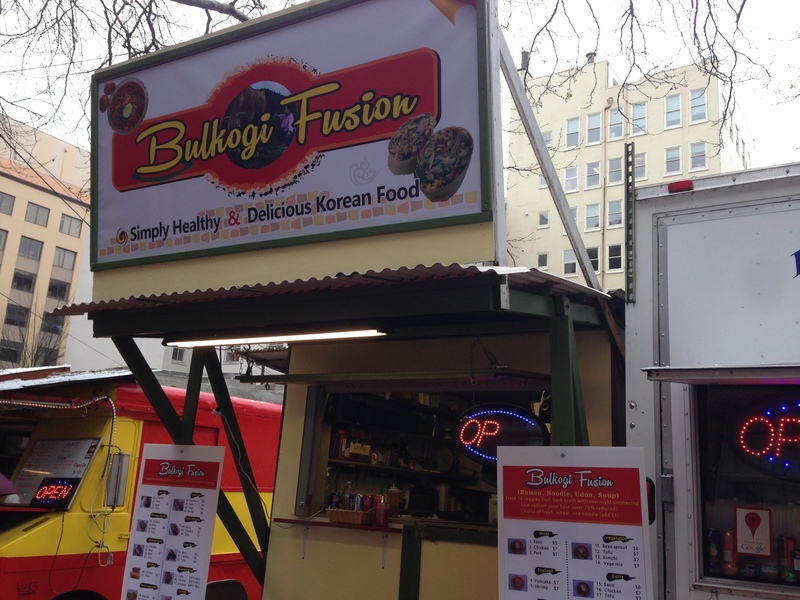 However, Korea was represented with two carts that seemed to push both fusion and traditional Korean cuisine. Along with noms from the Land of the Morning Calm, they had Indian, Mexican, Greek, Iraqi, Italian, Chinese, American, Thai, and Vietnamese eateries. The last option would end up being my lunch for the day as I finally chalked off a basic foodie necessity in the great book of “Food You Must Try”: banh mi. For those who are new to Vietnamese cuisine, a banh mi is essentially a Vietnamese sandwich, but it is much more than a sliced piece of bread stuffed with a plethora of mouth-watering ingredients. It was born out of Vietnamese subjugation by the French during the Age of Colonialism. When two very different cultures come in contact, you can be certain if anything will be exchanged, it will be different types of food and drink. While the Vietnamese introduced the French to indigenous specialties like pho, the French brought their wizardry with baked goods to the people of Vietnam. 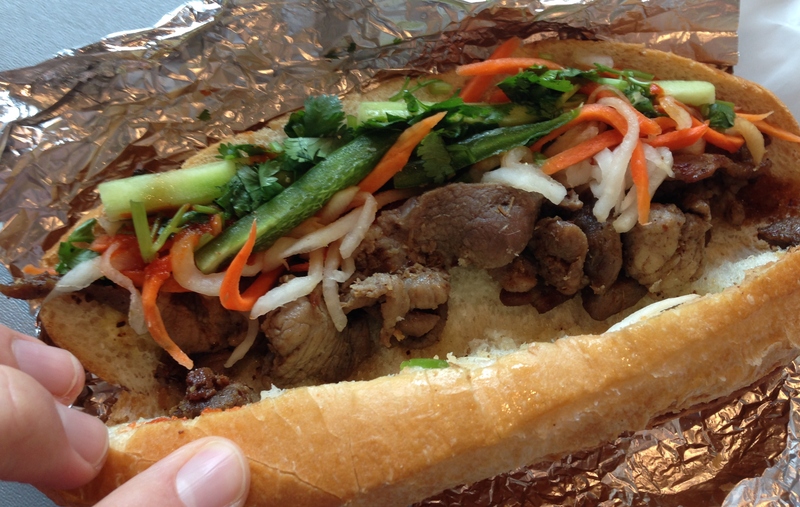 The ubiquitous French baguette quickly became integrated into the Vietnamese food landscape in the form of banh mi. The locals took the baguette recipe, compliments of their European overlords, and tweaked it to have a slightly lighter consistency than the ones found back in La Patrie (France). 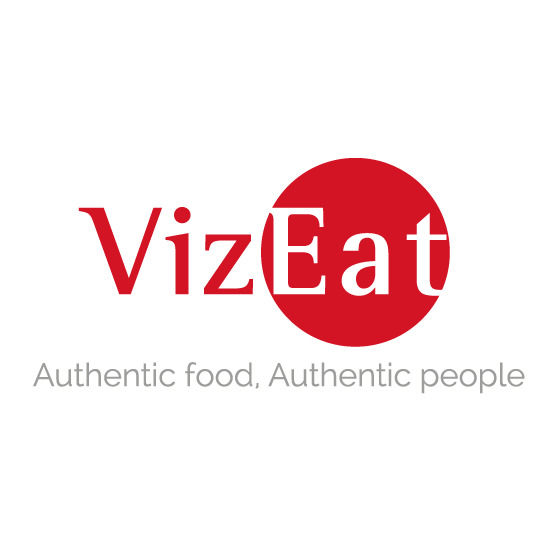 After that, the Vietnamese people filled these baguettes with Vietnamese ingredients to give birth to one of the most famous examples of fusion food before it became a buzzword coined by Mr. Puck. I had never tried it before much to the dismay of some of my friends, so when I saw the very unassuming Vietnamese cart that didn’t even have a sign up, I knew I had to try it. If they didn’t have to advertise, they must be good. 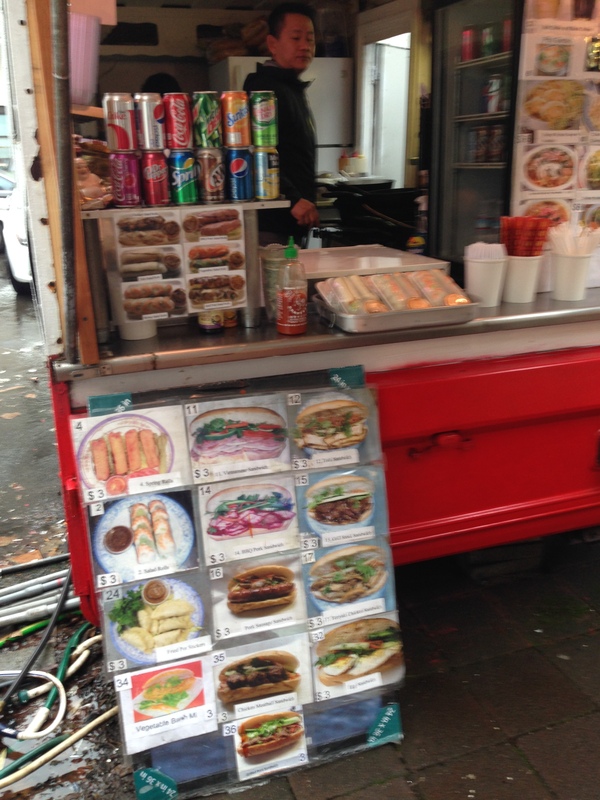 The head cook beckoned me over with a hello and a smile, and after looking over the large list of banh mi, spring rolls, and pho, I got the grilled pork banh mi ($3). As soon as I finished my transaction, I turned around to see a crowd behind me, so perhaps I either beat the lunch rush or led the charge to try something new. It eventually was handed to me, and it looked absolutely beautiful. It tasted just as sublime as well. First, I crunched my way through the crispy crust of the baguette to the chewy white interior which really did taste airier than a French baguette. I then reached the promised land of juicy grilled pork, onions, verdant peppers, pickled carrots, and plenty of cilantro for an herbal punch right in the taste buds. All of this, combined with the sweet and spicy Sriracha sauce, left me greatly satisfied and ready to take on the rest of the day. 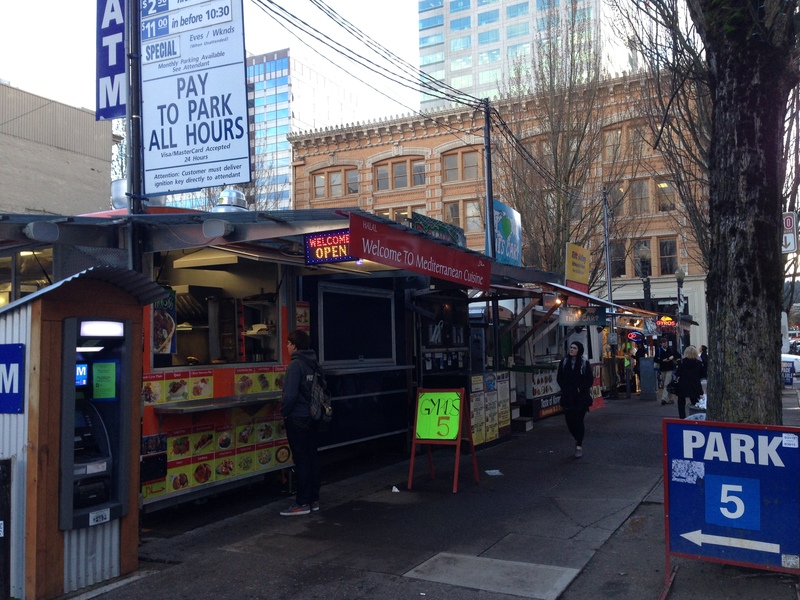 I highly recommend banh mi and checking out Portland’s food cart scene.